The rejection of the European bailout terms in the referendum this month is only the latest example of the Greek people sticking a finger in the eye of Europe even if it means suffering financial calamity. ultimately triggered one of the most consequential events in modern Greek history, a decision that continues to reverberate to this day. Then, as now, Greek voters surprised Europe with a display of national pride and pique, and defiantly suffered the consequences. The country has never fully recovered. The year was 1920, and Greece was embroiled in a war in Turkey that was largely the fault of the victors of World War I: Britain, France and the United States. The trouble began in 1919 when the Italians walked out of the Versailles peace talks because President Woodrow Wilson refused to grant them territory they were demanding along Adriatic Sea. Rebuffed, Italy sent warships to Turkey with the intent to seize the port of Smyrna, the richest city of the crumbling Ottoman Empire. Wilson and Prime Minister David Lloyd George of Britain were furious, but not so furious that they were willing to send their armed forces to forestall the Italians. Instead, they invited Greece to land troops. Greece had its own designs on western Anatolia, fueled by a desire to reclaim ancient lands and sovereignty over hundreds of thousands of ethnic Greeks who were Ottoman subjects. The results were disastrous. The Greek landing in May 1919 stoked Turkish nationalism, and soon Turkish rebel forces were engaging the Greek Army, harrying its troops, drawing them east of Smyrna, deeper and deeper into Anatolia’s rugged interior. The Greek soldiers fought valiantly, but the challenge was too big for a small country, poor then as it is today. Borrowing heavily, the nation of roughly four million people managed to put a quarter of a million men under arms. But the fighting left the Greeks terribly overextended, financially and militarily. Against all odds, the Greek Army managed to take and hold vast territory. The crucial event that brought it all down came in 1920. Defeat began with a monkey bite. That October, the young king of Greece, Alexander I, was walking in his garden when he was bitten by a pet monkey. The wound became infected and he died of blood poisoning later that month. The unfortunate incident occurred just before parliamentary elections in which the Greeks, surprisingly, turned out Prime Minister Eleftherios Venizelos, architect of the Turkish war and darling of both Wilson and Lloyd George. 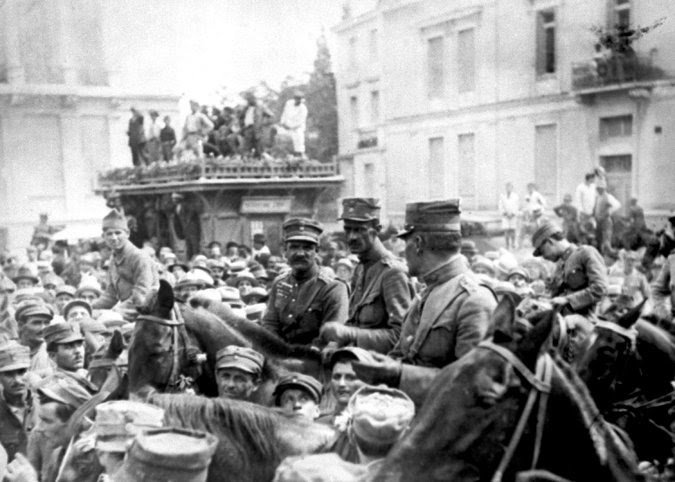 Then, even more astonishingly, the country held a referendum in which voters decided by an overwhelming majority to recall their previous king, Alexander’s father, Constantine I.
Constantine, widely seen as pro-German, had been deposed and forced into exile in 1917 after a power struggle with Venizelos over the king’s unwillingness to bring Greece into the world war on the side of the Allies. Moreover, Constantine’s wife was Kaiser Wilhelm’s sister. He had gone to school in Germany, held honorary rank in the German military, and though he had insisted on Greek neutrality in World War I, he showed a decidedly pro-German tilt: When French troops landed near Athens during the war, the Greek Army fired on them. If Constantine was restored to throne, the Allies icily informed Athens, financial aid to the country would be cut off. The message was clear, and the outcome inevitable: The beleaguered Greeks, militarily overextended and woefully dependent on the Allies for financial support, clearly would have no option other than bowing to their creditors’ demands. But in a proud, impractical and stirring exercise of national sovereignty, the country thumbed its nose at the Allies. Constantine returned to the throne that December. Angered, France and Britain set up a financial blockade, withholding loans that been promised during the world war and that remained payable to the Greeks. The United States also reneged on loans. The drachma lost much of its value. Greece was isolated. Desperate, the country’s finance minister sought to solve the debt problem by ordering citizens to literally cut their bank notes in two — one half represented half the face value of the currency, the other was considered a loan to the Greek government to pay for the war. One half of a 50-drachma note became worth 25 drachmas, and the other half became a loan to the government, redeemable as a bond. In August 1922, the Turkish nationalist army delivered a crushing blow, defeating the Greeks in the Anatolian interior. Smyrna was retaken on Sept. 9. The modern republic of Turkey was established as more than a million ethnic Greeks were forced out of Anatolia, effectively ending 3,000 years of Greek presence in Asia Minor. Refugees swarmed into Greece, raising the population of the destitute nation by 25 percent to nearly five million people. There was little food and medicine. Men, women and children died of disease and starvation by the thousands. Homeless refugees slept in the streets of Piraeus, Athens and Thessaloniki. The flood of impoverished people had an immense impact on Greek social and political life. The government was forced to borrow more money at high interest rates, further ravaging the nation, and slums and shantytowns sprung up as the new arrivals sought shelter. Anger and alienation (often expressed in rembetika music — the so-called Greek blues) fueled a new radicalism and permeated Greek political discourse through the 20th century. It continues to this day. Would Greece today be a bigger, richer and more stable nation if the Greeks of 1920 had heeded the Allies and let Constantine live out his life in Switzerland? The attempt to enlarge the nation by annexing part of Anatolia had been a very risky affair at best, and perhaps it was always beyond the country’s grasp, but any hope of success evaporated with the referendum. In the end, the war was lost — and the king was sent away and died in exile. History doesn’t indulge hypotheticals but it does demonstrate patterns — then as now the Greek people, headstrong and seemingly born defiant, have demonstrated, once again, that they are willing to pay a high price to affirm national pride and sovereignty. Αναρτήθηκε από hlektratv@gmail.com στις 1:22 μ.μ.